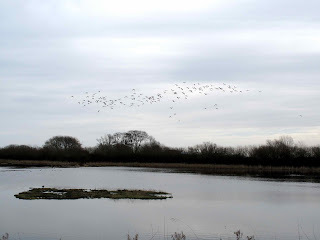 This morning we went to Tophill Low nature reserve. There was quite a lot of high cloud and we didn't see the predicted sunny spells, but it was a mild day and wonderful for a winter walk. Tophill Low is a purpose-built nature reserve around water treatment works owned by Yorkshire Water. 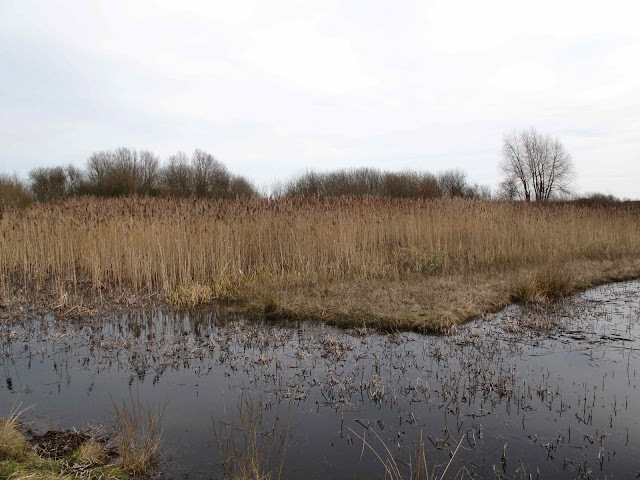 There are two deep water reservoirs (called 'O' and 'D' reservoirs due to their shape), ponds and marshes with islands, reed beds and wooded areas. The diversity of habitats attract a range of bird species (150 are regular in the reserve) and also dragonflies and other insects. There is a visitor centre (now in need of some refurbishment) with a viewing area into a bird feeding station next to a pond and a meadow. There are 12 hides, several of them accessible to wheelchairs (and pushchairs!). The mashes were teeming with birds and we saw a range of species. 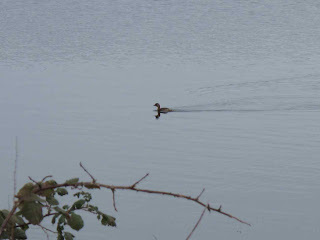 We walked around the 'O' reservoir and the various ponds around it, and also had a look at the Watton Nature Reserve. 2. Cormorant. Watton Nature Reserve. 11. Buzzard. Flying over Car Park. 16. Lapwing. More than 100 flushed from South East Marsh. 18. Black-headed gulls. Bev rd. one carrying something, others chasing. 20. Collared doves. Singing, one carring stick in Dunswell. 21. Green Woodpecker. Laughing in flight, pair. 22. Great Spotted Woodpecker. Feeding Station (FS). 25. Blackbird. FS. Also, when we are leaving a singing male from the aerial in front of the house. 26. Song Thrush. FS. Eating of the meadow. 32. Rooks on nests Woodmansey. The Reserve's website, including a map, at Yorkshire Water.